Tonight may not mark the ultimate round of 2018 high school football, but it's close. Tonight, in the penultimate round of the 2018 regular season, we've got huge matchups in the Three Rivers League, more in the Mt. Hood Conference and more yet in Class 5A's Special DIstrict 1. • No. 2 Lake Oswego (3-0 in TRL play, 6-1 overall) at No. 8 Tualatin (1-1 in TRL play, 6-1 overall), 7 p.m.
• No. 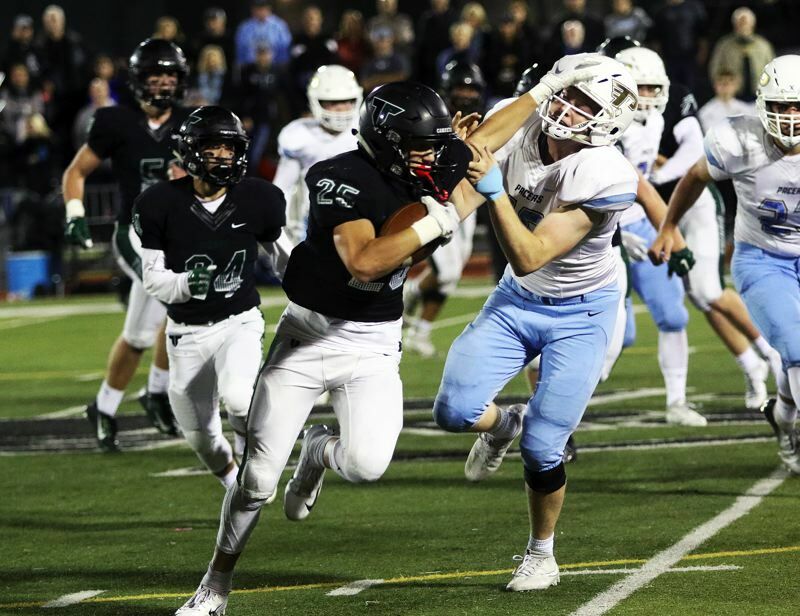 7 Tigard (2-1 in TRL play, 6-1 overall) at No. 5 West Linn (2-1 in TRL play, 5-2 overall), 7 p.m.
• No. 13 Central Catholic (2-0 in MHC play, 4-3 overall) vs. No. 10 Barlow (2-0 in MHC play, 5-2 overall) at Stapleton Field, 7 p.m.
• No. 16 Sherwood (2-0 in Pacific play, 3-4 overall) at No. 9 Liberty (2-0 in Pacific play, 5-2 overall), 7 p.m.
• No. 21 Parkrose (3-2 in SDI-E play, 4-3 overall) at No. 13 La Salle (4-1 in SDI-E play, 5-2 overall), 7 p.m.
• No. 23 St. Helens (2-3 in SDI-W play, 3-4 overall) at No. 12 Forest Grove (3-2 in SDI-W play, 5-2 overall), 7 p.m.
• No. 5 Scappoose (4-1 in SDI-W play, 5-2 overall) at No. 35 Cleveland (0-5 in SDI-W play, 1-6 overall), 7 p.m.
• No. 17 Molalla (1-3 in SDI play, 2-5 overall) at No. 1 Banks (4-0 in SDI play, 6-1 overall), 7 p.m.
• No. 22 Crook County (1-3 in SD2 play, 3-4 overall) at No. 6 Estacada (3-1 in SD2 play, 6-1 overall), 7 p.m.
• No. 32 Gervais (0-5 in SD2 play, 0-7 overall)at No. 26 Chemawa (0-4 in SD2 play, 0-5 overall), 7 p.m.